I developed the Max Canyon on a fly fishing trip on the Deschutes River. I had been catching fish using old standards like the Skunk and Brad's Brat, but I wanted to develop a pattern I hoped might be more effective. So, with these flies in mind, I tied a fly using a black, orange and white color scheme. The next morning I began casting using the Max Canyon on the tippet and the Skunk on the dropper. The results were amazing as I hooked and released six fish that took the Max. Switching the flies' positions made no difference. 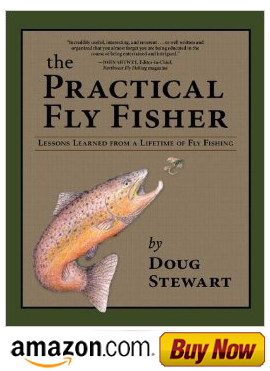 Read my October 11, 2013, post, "Tying and Fishing the Max Canyon," for the entire story and the fly tying instructions. The Dark Max was created by Larry Piatt. He wanted to make the Max Canyon a little darker and give it a lower profile. He tied in a flat gold Mylar tip at the hook bend in place of the orange and white calf tail. Then he replaced the white calftail underwing with black calftail. This fly is very effective, especially in off color water. The Stewart was created by Marty Sherman. He wanted to tie a fly with the same color scheme as the Max Canyon but a little darker. He replaced the orange and white tail with golden pheasant tippets, made the body all black with gold tinsel and made the underwing black instead of white. Marty first called it the Dark Max, but he found out that Larry Piatt had already claimed that name. He thought the fly should somehow bear my name so he called it The Stewart.